It’s now almost eight years since since Norton proprietor Stuart Garner, 47, acquired the rights to the historic marque from its previous American owner, Boston financier Ollie Curme. With the name, Garner obtained the prototype Commando 961 streetbike that Curme had commissioned from the USA’s number one twin-cylinder Norton guru, Oregon-based Kenny Dreer. And since then, heaps of hard graft entailing long hours, a good bit of risk taking, and several major changes in strategy have put the born-again Norton Motorcycles back on the map, with what Garner says is “getting on for 2000 motorcycles” so far built and delivered to owners around the world, as far afield as Japan, the USA, Canada and Australia. Until now, these have predominantly consisted of the twin-shock Commando 961 retro roadster in Café Racer, SF or Sport guise – essentially Dreer’s prototype as subsequently productionised in the UK. 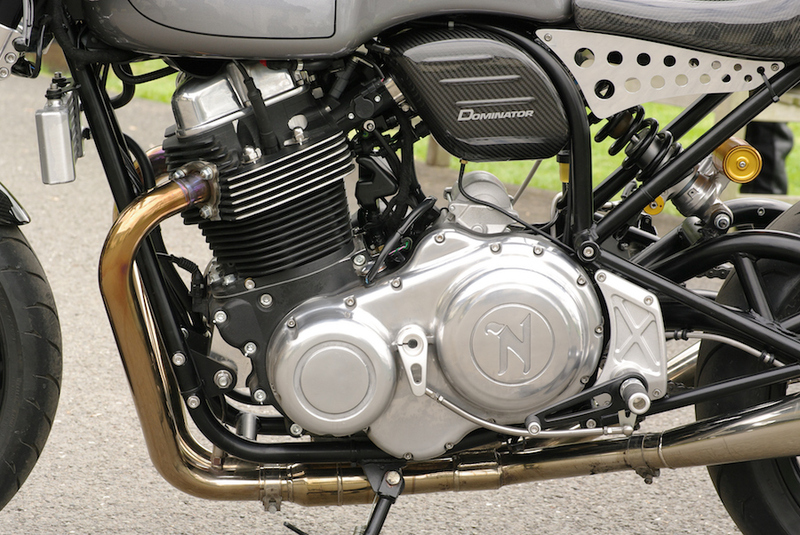 But after the sold-out success of the first limited edition variant on the firm’s existing air-cooled parallel-twin theme – the raucous, raw-edged Norton Domiracer with special monoshock frame which debuted in 2014 and whose production run of 50 bikes with open megaphone exhausts was spoken for within just one week at a price of GBP 24,000, or just over A$50,000 including the road-legal homologation kit – Garner and its creator Simon Skinner, 42, Norton’s Head of Design, decided to build something new. 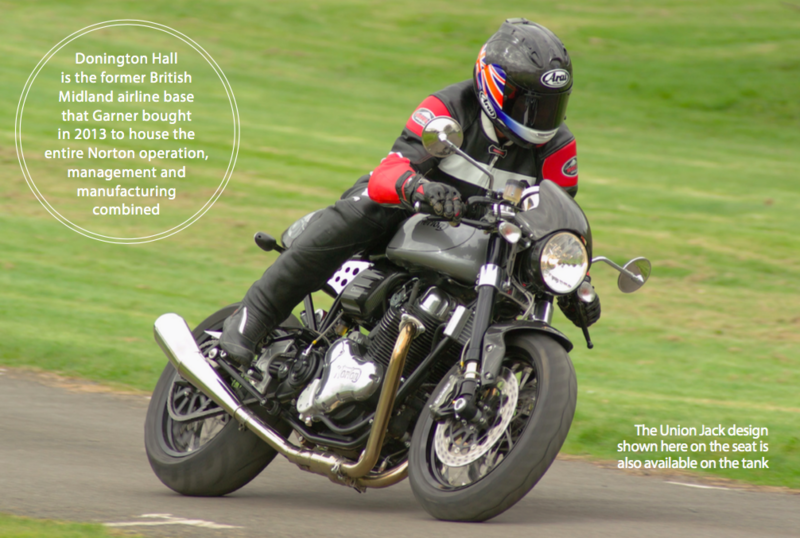 That bike was the Dominator SS, an only nominally less extreme version of the Domiracer of which a total of 200 examples were built in 2015, just 50 of them for Norton’s UK home market. This once again attracted orders at the same 50 grand sticker price as the Domiracer, complete with the same shapely, costly, hand-made 20.5-litre aluminium fuel tank, but a silenced that which could be replaced by the open meggas as a paid-for option. 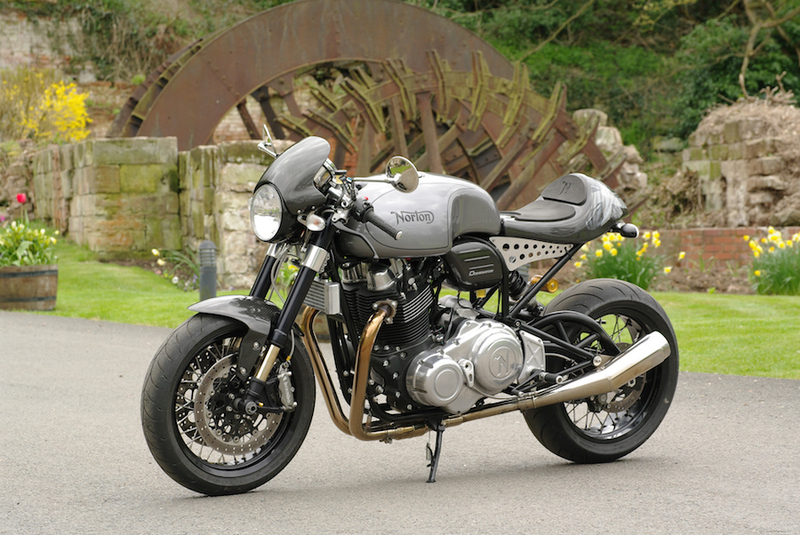 With this model – which revived one of the most significant names in Norton’s back catalogue – now also sold out, Norton has commenced manufacture of the series production monoshock Dominator selling for GBP 19,950 as step two in its model line-up, alongside the twin-shock Commando. In doing so, the firm has essentially brought the Domiracer to its street range. The new model also incorporates the improvements to the air-cooled OHV 961cc Norton engine measuring 88 x 79mm to be found on the newly introduced Mark II version of the Commando, as Simon Skinner explains. The new Dominator represents a café racer for the modern era that’s quite a bit more civilised than the Domiracer it’s derived from. It still has the same bulldog look that Skinner aimed for in designing its predecessor, with plenty of aggressive attitude by having the front pushed down and the rear lifted, to create a butch-looking stance. Though Skinner insists it’s not a retro bike, it is indubitably a modern-day version of the Dominators which flew the Norton flag in Swingin’ Sixties street dust-ups at the Ace Café, the Busy Bee and the like. It uses a revised version of the stock Commando’s chrome-moly tubular steel duplex cradle frame, still with a fabricated backbone doubling as the oil tank for the dry-sump OHV pushrod engine, but with strong overtones of the original Model 88 Dominator’s cutdown Manx Featherbed frame (see breakout). 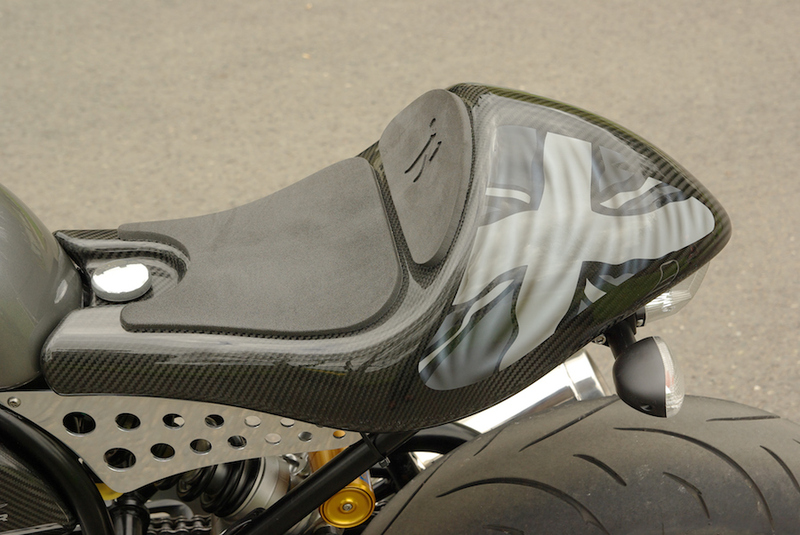 This is made in house at Norton by the skilled craftsmen who previously plied their trade at local chassis specialists Spondon, before Stuart Garner completed his purchase of the firm, and moved it to Norton’s HQ at Donington Hall. While retaining the same steering geometry, with the black-anodised Öhlins 43mm fork set at a 24.5º rake with 99mm of trail, the Dominator’s front end sees the fork legs carried in good-looking aluminium triple clamps that are CNC-milled in house at Norton from solid billets via 3D CAD and five-axis machining programs, then hand-finished. 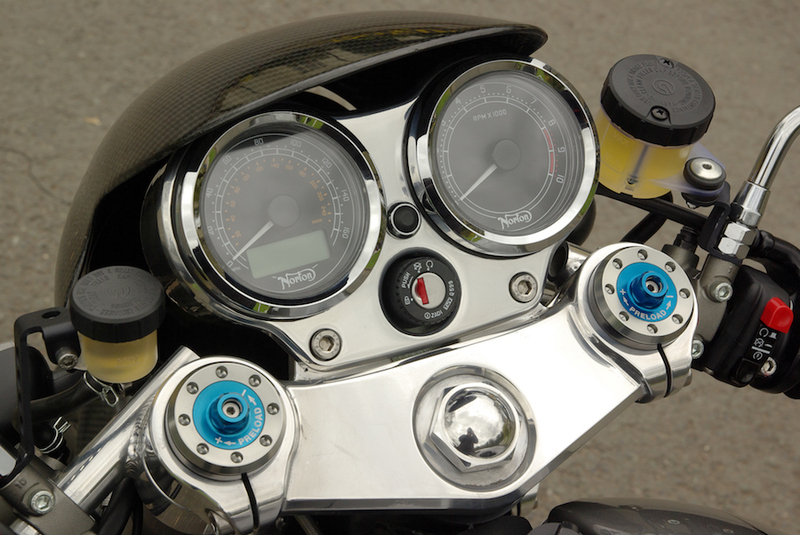 The wire wheels add to the period look, though a more modern contrast is provided by the bare carbon fibre seat with monochrome Union Jack interwoven into it, the carbon airbox under the seat whose fluted sides recall a period oil tank (even if this modern Norton’s engine lubricant is carried in the frame’s steel backbone), the Brembo radial brakes, and the fully adjustable TTX36 Öhlins cantilever rear monoshock especially developed for the bike by the Swedish sultans of suspension. 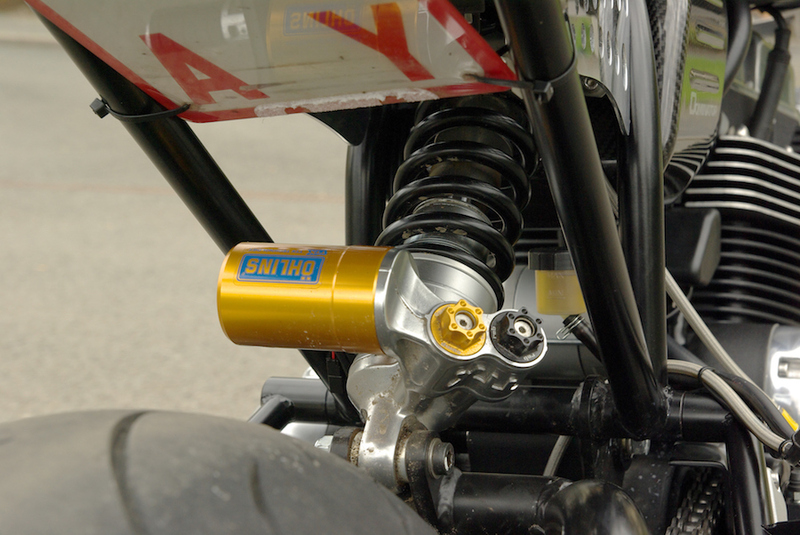 The rear shock is operated by a tubular steel swingarm giving a 1440mm wheelbase that’s 20mm longer than the stock Commando’s. This, plus the raised rear end obtained via the longer monoshock, throws more weight on to the front end for extra grip from the front Dunlop Qualifier when ridden hard, as the Dominator which sat awaiting me outside Donington Hall in the spring sunshine was crying out for me to do. This is an angry-looking motorcycle that looks ready to pick a fight with all and sundry, and to be doing the ton just standing still. For Skinner’s styling indeed has the Dominator bursting with barely restrained aggression – an impression that’s amplified in every sense of the word when you thumb the starter motor, and the undeniably butch-looking 961cc parallel-twin motor thunders into life, then settles to a throbbing 1300rpm idle. This turns into a meaty burble when you blip the throttle, in spite of the silenced exhaust now fitted to the bike. My test ride in fact had the optional so-called ‘Short Noise’ exhaust fitted, costing an extra GBP 895 but not homologated for street use, though its decibel level is infinitely more sociable than the Domiracer’s was when I rode it two years ago on its debut, and somehow avoided attracting the attention of the noise police. 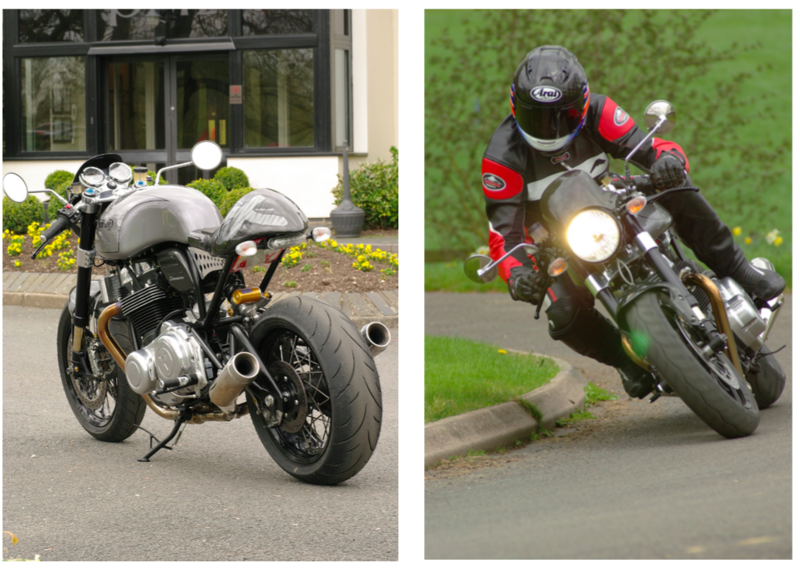 However, thanks to its 270º crank the new Norton sounds more like a 90º V-twin Ducati, not a classic British parallel-twin – which doesn’t mean it doesn’t sound good, just not like your expectations tell you a trad-type Norton twin like this one really should. Though the engine is completely unmodified internally, it actually makes 3kW more power than in Commando guise, says Skinner, not only because of the open meggas, but also thanks to the 1.5-litre bigger airbox and the 35mm throttle bodies’ 20mm shorter velocity stacks. But it’s the solid grunt peaking with 89Nm at 5200rpm that really dictates how you ride this bike, short-shifting around 5000rpm to surf the waves of torque delivered via a practically horizontal curve from barely off idle. And yet it doesn’t run out of breath up high, just keeps on pulling almost to the redline. Because of that muscular acceleration, there’s really no point in revving the Dominator out to its 8000rpm limiter, even if the single gear-driven counterbalancer installed in the motor means there are no vibes up high if you insist on doing so. Okay, so maybe Skinner was right – it’s not a totally retro racer-with-lights, so at least you’ll have a chance of surviving a ride with all your fillings intact, which wasn’t always the case with some classic Norton parallel-twins I’ve ridden. The born-again Dominator is indeed a satisfying blend of old and new, a mixture of period attitude combined with modern civility – like brakes that work brilliantly, tyres that warm up fast and grip well on a cool spring day, and suspension that while tautly set up as you’d expect a genuine sportsbike’s like this to be, also irons out bumps and lays that hefty torque to the ground with a degree of compliance that makes this a very confidence inspiring bike to ride hard. While completely uncompromising in its road manners, with that aggressive punch in the gears, low down fuelling is good, as when you’re just crawling along in a line of traffic. 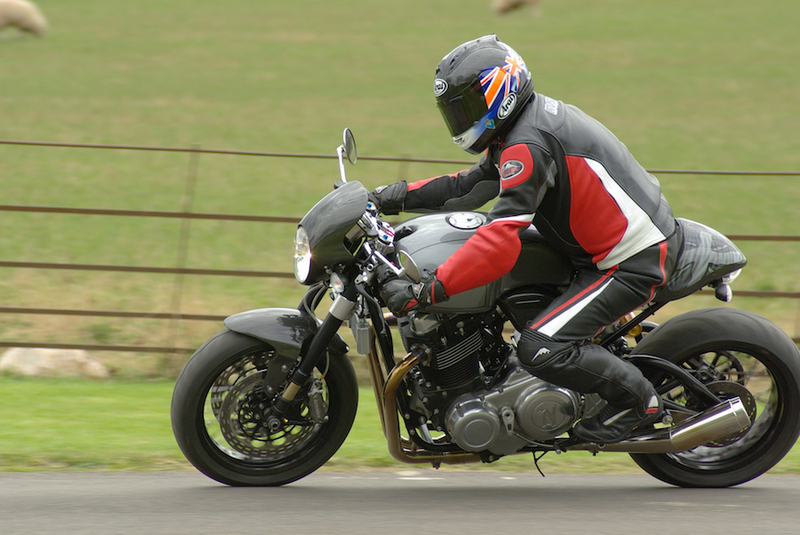 But then spot a gap and gas it up hard, and the Norton catapults you forward in a totally addictive way, and the meaty torque means it’ll take almost any gear you throw at it. It pulls hard from barely off idle, then strongly from 2000rpm upwards – this is an ultra-usable motor, with 4000 revs the gateway to more serious urge, and from there to where you can feel the engine peak out at 6500 rpm, is the happy zone. Its five-speed transmission certainly doesn’t need a sixth ratio, because there’s such a wide spread of torque and power that you can change gear when you feel like it, not because you must. And the Norton’s shift action is now flawless – infinitely better than the early Commando’s that Garner’s guys turned out back in the born-again brand’s start-up days. Handling has always been a strong point of any Norton, ever since the debut of the Featherbed frame back in 1950, and the new Dominator lives up to the expectations of the marque. It steers faultlessly, tipping easily and controllably into a turn on the radial brakes, as the Öhlins fork absorbs the weight transfer and settles the bike before you peel into the apex. Plus, the way the raised rear end has effectively tightened up the steering geometry makes it turn in really well, without being unstable on the brakes, and you can use a surprising amount of the considerable engine braking on offer without getting the rear wheel hopping. Weighing a claimed 15kg less than its Commando cousin, the 175kg new Norton feels light and agile, yet stable and forgiving, a confidence-inspiring motorcycle that you soon learn to trust completely over a variety of surfaces – hitting a bump cranked hard over in a 100km/h sweeper doesn’t unsettle it at all. The rear Öhlins monoshock may have taut damping settings dialled in, but with 140mm of wheel travel available it just shrugs off bumps, even on an angle once you’ve committed to a turn. 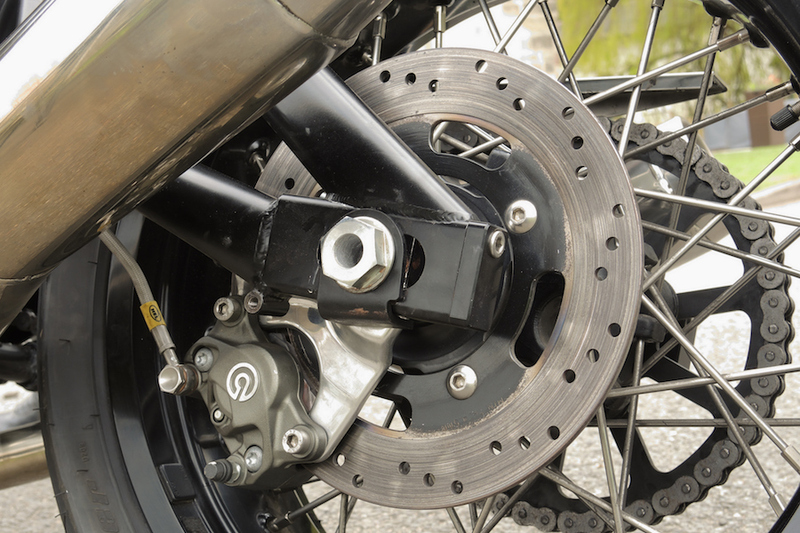 And the Brembo twin-disc brake package provides controllable, effective stopping power with just the right degree of sensitivity from the radially mounted calipers. This is a proper café racer, but in a modern context – even the riding position is more accommodating than they used to be Back Then, with not too long a stretch over that shapely fuel tank to the twin, relatively high-set clip-ons. In fact, the Dominator doesn’t seem as rangy as you might expect with that longer wheelbase; it feels relatively small and compact to sit on, especially compared to the stock Commando 961, and that’s a key reason in what makes it seem so chuckable and agile. Truly the best of both worlds, old and new, classic and modern. My chance to ride the new Dominator came exactly 10 years after being the first Brit to ride Kenny Dreer’s prototype Commando 961 in the USA, and eight years almost to the day after I exclusively disclosed former gamekeeper turned firework magnate Stuart Garner’s original deal to lease the Norton name from its American then owners Norton Motorsports Inc. Stuart converted this deal later that year to an outright purchase of the Norton marque, intending to revive the brand via a new generation of parallel-twin roadsters. Just over two years later, the first of these was delivered to its new owner, setting Norton out along the comeback trail. That progress was recognised last July, when the UK government announced a joint training and industry support initiative with the marque (see breakout). Garner has also raised over £10m in capital investment funds, which is being used to develop a 1200cc V4 engine that will power a new-generation luxury superbike that’s due to be revealed at the NEC Show in Birmingham in November, and a related range of liquid-cooled 650cc twins, both supercharged and normally aspirated. It’s been a struggle for Stuart Garner to get Norton re-established in the global marketplace, but it’s a battle that he now shows every sign of winning. That’s very appropriately marked by the debut of the new Norton Dominator, making it indeed yesterday once more – in every sense.